Attn: Regarding the course rating, it used to be 73.6 for 7104 yards. I estimate 74.2 because the recent renovation has lengthened the course extended more than 200 yards. The course is long, over 7,300 yards, over an almost flat terrain. You can see greens from tees on many holes, which gives you a good impression. Overall the course is not too tough and its fairways are relatively generous, so you don't feel it is as difficult as the total yardage might indicate. However, the course provides an excellent layout where good shots are rewarded and bad shots are penalized. The last 9 holes are especially great and you can enjoy all kinds of golf challenges with each hole varying dramatically. A gentle dogleg to the right with a drive over a lake and a bunker. The second shot is slightly uphill with a pond and bunkers on the front left of the green. The hole has very beautiful natural scenery. A dogleg to the left with a narrow fairway. The second shot is uphill to the two-tiered green. A downhill tee shot enables a long hitter to hit the green in 2. However, a lake crossing in front of the green might make you decide to lay up in front of the lake. The view of the green and its surrounding area is wonderful. A long, slightly uphill par 4. The tee shot needs to carry 200 yards to clear a lake. The bunkers in front of the green are well positioned. You can enjoy the natural scenery on this hole, too. An excellent par 5 that can can be reached in two shots. A precise and long drive is required down the narrow fairway guarded by bunkers. Bunkers are also well positioned on the second shot. A lake bordering the right side of the narrow fairway extends to greenside, so watch out on left to right balls. If you hit every shot accurately, you will be rewarded by a birdie. But if you slice or hook the ball, you end up with a bogey easily. This hole has undergone a big change in 2004. In the past, the landing area for drives used to be a lake and bushes, and you had to hit the fairway to the right of the lake, which does not exist under the current layout. Then, the second or third shot is across the lake to the green whose front is guarded by water, which made it a stunning dogleg to the left. The former layout was selected as one of the best 500 holes in the world in 2000 by US Golf Magazine. I don't know whether or not the new hole will be selected again (surely not) but the club maintains that the new hole is even more difficult. Personally I prefer the old hole but I can still completely enjoy playing the new one..
A very long par 4 because the uphill second shot makes the hole some 20-30 yards longer than its listed 459 yards. 4 bunkers in front of the green enhance the beauty and challenge. This is a hole where you are very happy with a par. It takes one and half hours from Hong Kong by a club car. The car is better and more comfortable than a bus because you can shorten the time through immigration. The course requires players to have handicap certificates and is open to members and their guests only. The adjacent hotel was very comfortable and its Chinese restaurant was very testy. I played in 2003 and the fairway conditions were bad because I guess too many players like to play at this popular course. At the end of 2003, the old fairway turf was replaced, so the course condition this time was good. This club immediately became famous because the World Cup was held at the World Cup Course in 1995. 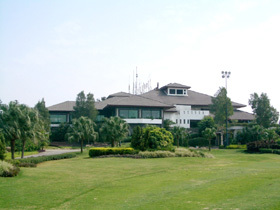 The Dynasty Cup, a Ryder Cup-style shootout between Asia and Japan, was also held at the World Cup Course in 2004 & 2005. Mission Hills GC is the world’s biggest golf complex with 10 courses or 180 holes as of 2004, overtaking the huge Pinehurst resort in North Carolina, which has eight 18-hole courses. The picture shows the 10 designers who are all world-famous players or a teaching pro. The 10 courses are designed by Jack Nicklaus, Vijay Singh, Nick Faldo, Jumbo Ozaki, Ernie Els, Annika Sorenstam, Rose - Poulter, Jose Maria Olazabal, David Leadbetter and Greg Norman. The two couses were added in 2007, Pete Dye Course and Zhang Lian Wei Couse (Par 3s course), so the club currently holds 12 curses or 207 holes. The other Jack Nicklaus designed courses in China are Spring City (春城湖畔度暇村) G&LR – Mountain Course, Chung Shan Hot Spring (中山温泉)GC – Jack Nicklaus Course, Pine Valley International (華彬国際) GC, Shanghai Links (上海林克司) G&CC, Hangzhou West Lake International (杭州西湖国際) G&CC, Suzhou Sunrise (蘇州中興) GC, Nanhu (南湖) GCC, Palm Island (恵陽棕櫚島) GC, Wuyi Fountain Palm (江門五邑蒲蔡) GC.